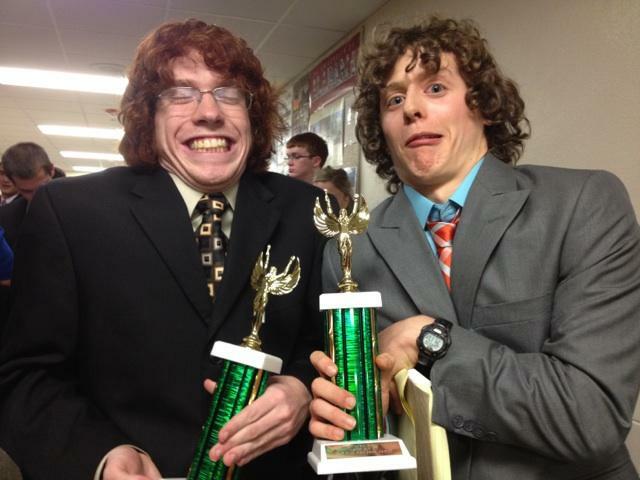 Senior Captains Andrew Hutchinson (left) and Stephen Turban (right) pose with their 3rd place trophies in Champ Public Forum Debate at the Clayton-Ladue Debate Tournament in November. The Debate team adapted to many changes this year: a new coach, a new team and a new year. Yet with the numerous changes the team endured, the semester was still an exciting one. Debate is a club that combines a variety of skills into a competitive atmosphere: logic, reasoning, teamwork, collaboration, speaking and research are just a few worth mentioning. The RBHS Debate team meets weekly to prepare and practice for upcoming tournaments, where we put our skills to the test against other talented high school students across Missouri. The events we compete in range from debates over foreign policy in the Middle East to humorous interpretations of popular books in what we call “individual events”. Each topic for debate is released at the first of the month prior to the month we will debate, so that we have plenty of time for researching, preparing and practicing for the tournament. Tournaments are challenging and exciting and overall, incredibly fun. At a tournament, typically held in Kansas City or St. Louis, you participate in a minimum of four debates or two individual event rounds and advance into final rounds depending on your performance in the earlier rounds. In these highly-competitive atmospheres, RBHS has been fortunate enough to come out on top numerous times, and each tournament we grow closer as a team and raise our expectations. Although this year has brought many challenges to the debate team, we have met success continuously at each tournament this season. We kicked off the year at Park Hill High School in Kansas City on Oct. 19, where we debated over the mitigation of climate change. Juniors Whitney Cravens and Sara Ashbaugh took home the first place win in public forum debate, an exciting way to kick off the year. 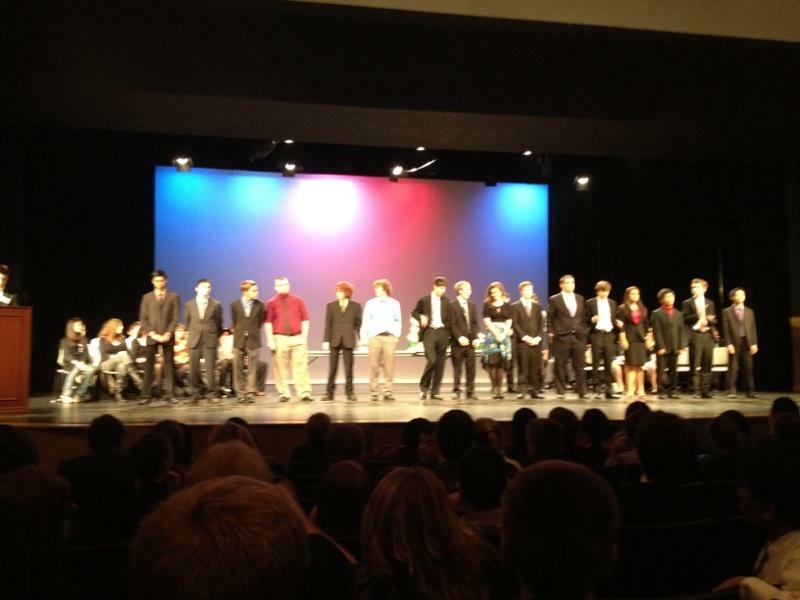 In mid-November, RBHS debate traveled to the highly acclaimed tournament co-held by Clayton High School and Ladue High School in St. Louis, where captains Stephen Turban and Andrew Hutchinson won third place in champ public forum debate after debating extensively over foreign policy in the Middle East. In individual events, Joe Pratt broke to supersession in Student Congress, and Stephen Turban received 4th place in Impromptu Speaking. In December, we closed the first half of our season at Pattonville High School in St. Louis, where Sara Ashbaugh received third in prose. This semester, we look forward to an exciting couple of tournaments and hope to share our experiences with other RBHS students, by expanding the number of debaters on our team. Debaters come from diverse backgrounds and have a wide range of personalities: there is no “stereotypical” debater. Therefore, any and all are welcome to join at any moment of time and are guaranteed to have a worthwhile experience on the debate team as we venture towards becoming one of the top high school speech and debate teams in the state of Missouri (while having a blast at the same time). Our next challenge is held at Liberty High School in Kansas City, where we will travel January 18th to debate the Supreme Court decision in Citizens United v. Federal Election Commission. Shakespeare once wrote, "Though she be but little she is fierce." I firmly believe he had Whitney Cravens in mind when his quill scribed this phrase. Whitney, standing at a powerful 4 feet 10 inches is the epitome of a natural born leader. She continues to go above and beyond to ensure the success of the many extracurriculars she participates in. I have been lucky enough to count her among my good friends since 1st grade, when even as a Mill Creek Cougar she displayed the common characteristics of an overachiever by stating her intentions to become a world renowned lawyer, and graduate from Harvard Law School. Whitney is a great friend to have around when you need something done well and done now, just make sure you have some diet coke with you to fuel her mightiness. Written by Kelsey Harper.